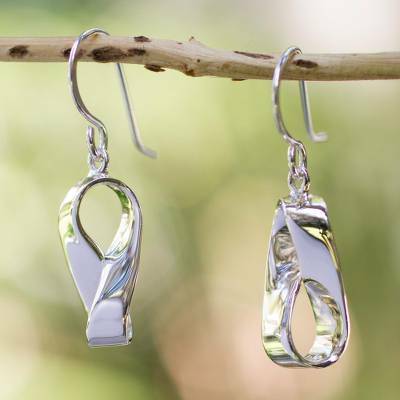 Handmade Modern Taxco Silver Earrings, "Modern Mobius"
A gleaming silver ribbon bends in an elegant curve to create the semblance of a Mobius strip. Handcrafted by Oscar Figueroa, these elegant earrings showcase the legendary art of Taxco jewelry. "Just as expected and hoped!" These are exactly as pictured and described - elegant and graceful. These earrings are not just beautiful and we'll crafted, they are also versitile and unique! Good price and great value. Exactly the length I like for my short neck! Earrings are polished silver and different from anything I've seen which I love! You won't be disappointed! Bought these for my sister. Large enough to show up but not bulky. Dressy but also fun! The earrings sparkle as they turn. The craftsmanship is excellent. My new go-to earrings. These earrings are exactly as pictured. I was looking for something unique that could be worn casual or dressy and these are perfect. All the stores have the same old, tired earrings. I love these and the price is a bargain. They arrived exactly 1 week after I ordered (standard shipping). This is my first time ordering from Novica but I will be a frequent customer. The only problem is there are too many beautiful items to choose from!!! These silver earrings are so unusual with the twisted surface reflecting the light in different ways when you turn your head. The earrings are handmade by a talented artisan and I will wear them often. These earrings will catch the light and reflect it - Workmanship is great and they are very unusual. I only wish they were a bit longer. "I love them and will wear them often. " They came in a timely manner and are beautiful; just as described and very shiny...a great size for casual as well as dressy. Good job whoever made them.